WASHINGTON — Two Muslim Britons murdered a soldier by running him over with a car then hacking at his body until he died, then tried to decapitate him. 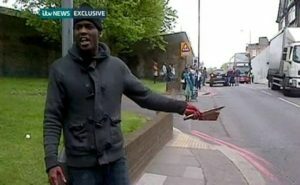 Reuters reported that “two Muslim converts” killed British soldier Lee Rigby this past year in broad daylight. They claimed it was retaliation against “the war on Allah”. 29-year-old Michael Adebolajo and 22-year-old Michael Adebowale were found guilty of murdering Rigby, age 25. They used knives and a meat cleaver to kill the man, after using their car to run him down. Also, their action was recorded by a bystander (under duress and at the behest of the murderers), where the murderers had blood-stained hands and claimed it was a response to the West’s “war on Allah” and Islam as a whole. Rigby had served in Afghanistan and at the time was wearing a military backpack. The brutal daytime murder led to anti-Muslim riots and protests, along with allegations and questions of whether the British security apparatus and spy resources could have stopped this heinous crime.